With just eight games left, we are well and truly at the “business end” of the season. Now, performances do not matter. But results do. At least, that is what Lucien Favre and co will be telling themselves after they edged past Hertha Berlin on Saturday. A stoppage-time Marco Reus goal to make it 3-2 means they remain level on points with Bayern. The Bavarians, however, are finding things a lot easier, at least domestically. They beat Mainz 05 6-0 during matchday 26 to stay on top and extend their goal difference advantage. Meanwhile, towards the bottom, Schalke look in more and more trouble each week. Domenico Tedesco was relieved of his duties after losing 7-0 to Manchester City, but new man Huub Stevens was not able to stop his side losing 1-0 to RB Leipzig. Augsburg won 3-1 against Hannover to put themselves 11 points clear of the automatic drop, whilst Stuttgart drew 1-1 with Hoffenheim. We cover all of the action, as usual, before moving on to our In Depth section. 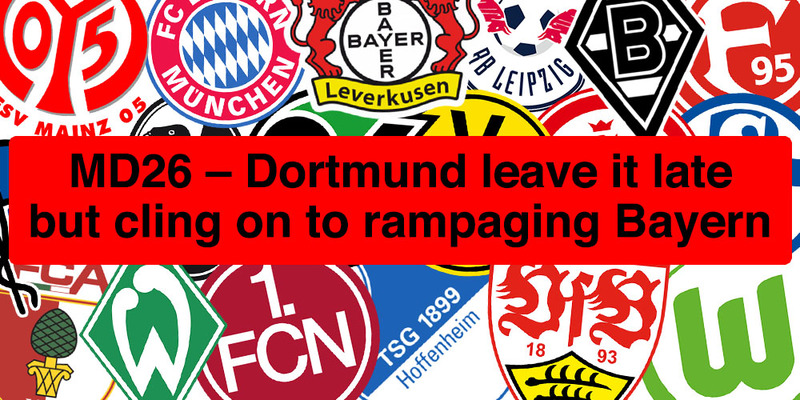 After our episode in which we previewed the fixtures between English and German clubs in the Champions League, we decided to review the clashes, in which all of three of the Bundesliga sides lost. We also discuss Eintracht Frankfurt’s Europa League run, which will continue in the quarter-finals.